Genetic Roulette—The Gamble of Our Lives has audiences rushing home to clear out their cupboards of dangerous genetically modified (GM) foods. The evidence presented in the film makes the best case yet for why genetically modified organisms (GMOs) are linked to disorders such as allergies, inflammatory bowel disease, infertility, autism, and cancer, to name a few. One health practitioner, Mary Tobin, L.Ac., said the film “provides abundant evidence that eating a GMO-free diet is the single most important change Americans can make for their health. That evidence not only includes doctors and patients testimonials, but also veterinarians and famers who describe dramatic health improvements in animals that switched to non-GMO feed. The categories of diseases that improve in humans and animals are the ones found in lab animals fed GMOs. And these are many of the same categories, e.g. immune, reproductive, and gastrointestinal disorders that have been on the rise in the US population since GMOs were introduced. This 85 minute documentary reveals, what Author John Robbins calls, “the bullying and deceit of the biotech industry,”— including manipulation of research, attacks on independent scientists and their findings, and infiltration and control of government regulators. The film also reveals for the first time to horrific impact among workers on a South Africa farm, who were consuming a higher amount of GMO corn than probably any other group in the world. Although this film’s eye-opening evidence in the film is sometimes shocking, it is by no means a downer. 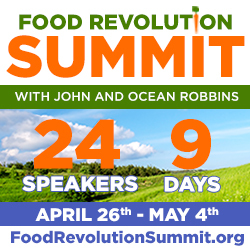 According to Robbins, it “shines a bright light of hope that we can reclaim our health and our food systems.”Smith explains that as little as 5% of the US population switching to non-GMO foods should deliver a tipping point, inspiring food companies to kick out GM ingredients. It was such a consumer rejection that already kicked GMOs out of Europe. The film is being released right in the throes of the California campaign for Prop 37. If it passes in November, food companies will have to label products made with GM ingredients (like they do in nearly 50 other countries). Not only will this make it far easier for people to buy healthier non-GMO choices, the expected migration away from labeled GM products will probably accelerate the tipping point. Genetic Roulette—The Gamble of Our Lives is a production of The Institute for Responsible Technology (IRT). Genetic Roulette—The Gamble of Our Lives, from September 15-22. The film lays bare the serious health impacts of genetically modified foods (GM) as reported by scientists, doctors, veterinarians, as well as other experts. We are launching this free viewing week now because the movie can better equip voters in California with additional information on GMOs that they need to make sensible choices for Prop 37, which would require labels on GE foods. Otherwise they might fall prey to Monsanto’s multi-million dollar disinformation campaign.